Warning, warning picture heavy post coming up! Finished quilt measures 45 inches x 45 inches. The Lady of the Lake quilt is finished in all its glory - backing, quilting and binding complete. Basting took place eventually late Friday evening after much procrastination, but the usual basting discomfort was much alleviated by the use of a nifty notion recommended by Cheryl from Naptime Quilter. 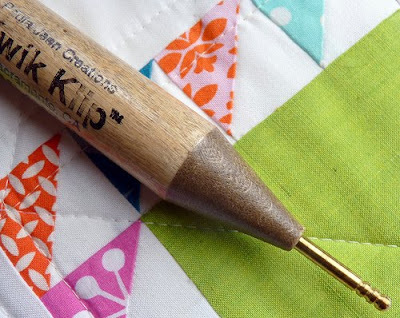 The Kwik Klip helps to close basting pins without effort, so no sore or pricked fingers, although as karma would have it I scored the biggest paper cut on the weekend at work - yikes why does that have to hurt so much?! (Kwik Klip YouTube Video here - although I did end up using the Kwik Klip as I felt most comfortable myself). 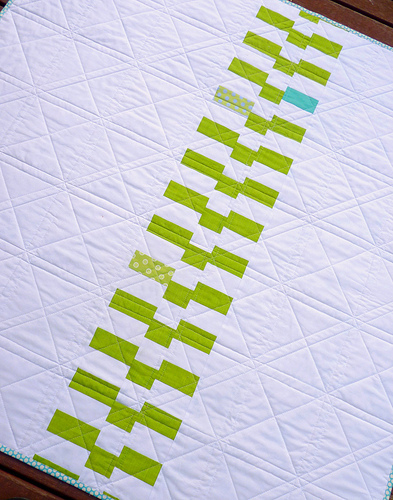 The back of the quilt features some rather minimalist piecing, a really simple but modern design using left over solid fabrics. 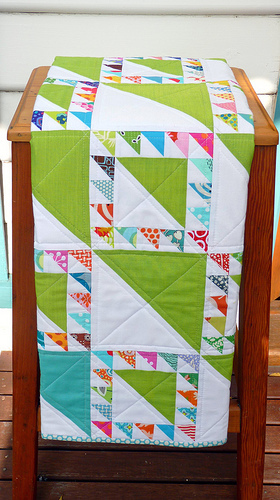 The above picture of the quilt back also depicts the quilting lines rather well; keeping it simple and no fuss. 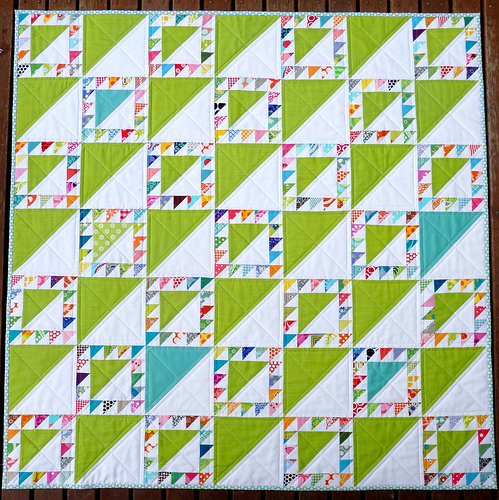 I thoroughly enjoy piecing with small patchwork units, and I do believe I still have many more Half Square Triangle units left in me! I am not finished yet. Just beautiful Rita. 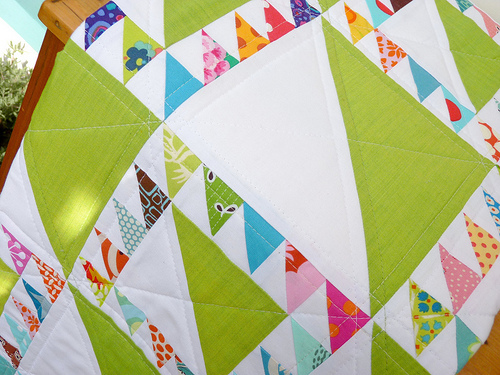 The quilting is fantastic and I love the backing design! That is asbolutely beautiful and looks so neat and perfect. My quilts are always lumpy and bumpy and pulled and skewed but yours always look spot on. I'm so happy that the Kwik Klip worked well for you. Another great finish. It really is impossible to tire of HSTs! I bow down to your mastery of perfect points! I am having sooo much trouble with HSTs (in voile) right now I've but the project away until I can bear to look at it again. This quilt is just absolutely beautiful in every way! And thanks so much for mentioning my blog in your sidebar! A lovely, happy finish! 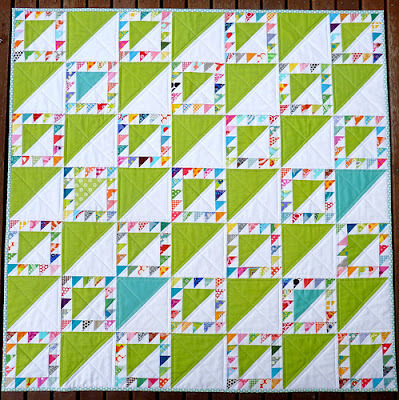 It is so great to see an old pattern dressed up in modern, colorful fabric - can't wait to se you explore more of the beautiful old blocks, Rita! The quilt is beautiful! I love the binding! I love the design and especially the few triangles of a different color being randomly placed! I admire your ability (desire even) to work with tiny pieces and keep all your points so perfect. This is definitely your patchwork genre!! I absolutely adore this quilt! So fresh and bright! Absolutely stunning! It's gorgeous, Rita! I love my Kwik Klip...can't pin without it! It's just gorgeous! I love the backing. Really gorgeous. We'd love to feature it on Modify Tradition! Beautiful quilt - I know you are happy with it!! I love the back - may use it as inspiration for my next quilt back!! Rita, Another beautiful quilt! Simple but gorgeous! That is a gorgeous finish. Hope it finds a happy home soon. I love it. You just have such a great eye for color. Gorgeous quilt!! And I enjoyed EVERY single picture...did you hear the ohhhs and ahhhs coming from West Coast Canada? Absolutely gorgeous. Every time I see one of your new quilts, I think "that is my favorite." This is DEFINITELY my favorite. But I'll probably say that about your next quilt. Beautiful work, as usual. You've done a beautiful job once again. I think that back is stunning with this quilt......not too much going on, but striking all the same ! I'd love to see you add one more line of quilting just the same width inside your binding as you quilted beside all the major seams. I think it would look just that one little bit more finished. Please, forgive me if this advice is unwelcome. What a pretty quilt, great colors. You did a wonderful job. This quilt is just beautiful! I like to live dangerously and use an old seam ripper to help me close my safety pins when I pin baste. Gorgeous. 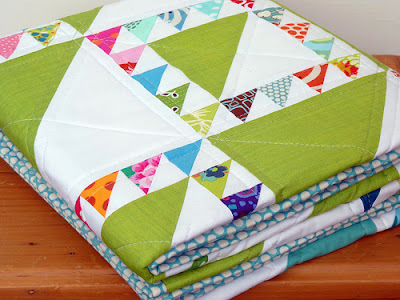 Love the colors, love the simple quilting, love every little bitty bit of it! 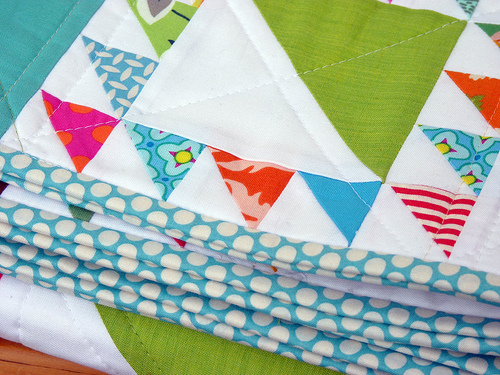 This quilt is so lovely...I am very jealous of you patchwork and quilting skills. The polka-dotty green piece = genious. Love this quilt. LOVE IT! It's so fabulous! I am really lost for words...that is just so beautiful! THAT is an amazing quilt. I adore it. I want it. So nice! Love the green. Stunning. I really love the colors. I just remembered this quilt of yours and think this may be the "perfect pattern" for the bundle of "Terrain" that just arrived! yippee!